A young girl who lives across the street from the reclusive Emily Dickinson gets her chance to meet the poet when her mother is invited to play the piano for Emily. The girl sneaks up to Emily's room and exchanges a small gift for an authentic poem, which is included in the book. Michael Bedard was born and raised in Toronto, where he still lives. His novels include Stained Glass, A Darker Magic, Painted Devil, and Redwork, which received the Governor General's Literary Award and the Canadian Library Association's Book of the Year Award for Children. 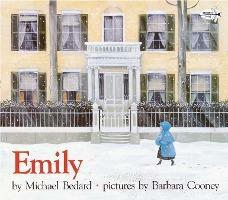 He has also written several acclaimed picture books, including The Clay Ladies, which received the Toronto IODE Book Award, and Emily, a story about Emily Dickinson, illustrated by Barbara Cooney. Barbara Cooney traveled the world, lived in a house by the sea in Maine, and made the world more beautiful through her art. She was a two-time Caldecott Medal winner, for Chanticleer and the Fox in 1959 and Ox-Cart Man in 1980. Her beloved book Miss Rumphius was the winner of the American Book Award in 1982. Barbara Cooney died in 2000 at the age of eighty-two.